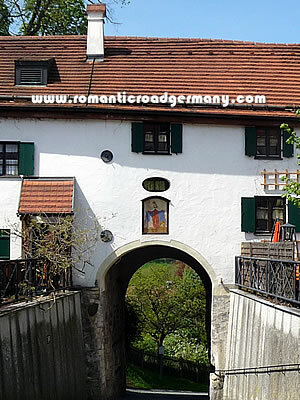 Schongau is one of the last main "stops" before the southern and final section of the Romantic Road. South of Schongau (and its neighbour Peiting) the Romantic Road starts to head into the alpine foothills and through smaller villages until it reaches the towns of Schwangau and Füssen. This is the start of a part of Bavaria which is known as the Pfaffenwinkel - the name comes from the local dialect for priest and literally means "priests' corner". It is famous for its pretty rural scenery and the number of historic churches and monasteries. To the north is the town of Landsberg am Lech, which shares a similar history centred around a strategic position along the River Lech. The important strategic position of Schongau on a defensible hill above the Lech means that it has a very long history of settlement. Finds from the Bronze Age have been made in the area, along with Roman remains. Schongau is surrounded by fortified walls built in the Middle Ages - parts of them can still be walked around - and those fortifications were built to protect the wealth created by its position on the river and on important European trade routes. Schongau stood near the Via Claudia Augusta, an old Roman road from Italy to Augsburg which was a major trade and communications route even after the fall of the Empire, and on the Salt Road from Berchtesgaden westwards. The Lech itself was also an important source of goods due to the healthy rafting commerce. 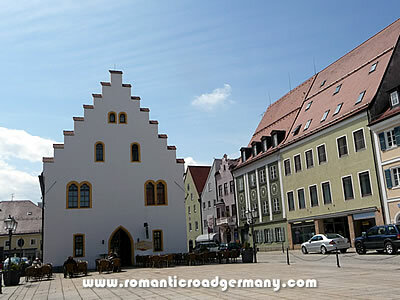 The main square in the centre of the old part of the town is dominated by the Ballenhaus - an old storehouse and council chamber built in the 15th century - at one end and the Church of Maria Himmelfahrt at the other. The stature of Mary gives the square its name - Marienplatz. To the east is the former Carmelite Monastery - now a care home - and the Church of the Holy Ghost - the walk around part of the town walls used by the sentries can be made in this area. There is also an external path around the base of the walls which gives good views of the remaining town towers, down to the Lech and, on a good day, through to the mountains to the south.